Want it by Monday 29th April? Order within 10 hours and choose FREE UK Next Working Day Delivery (Mon-Fri) at checkout. 1 Hour Fire Rated Access Panels, with UKAS 36dB Rating & Smoke Test Pass! Tested to the relevant up to date harmonised British/European method meeting BS EN 1634-1: 2008 Fire resistance tests for door and shutter assemblies – Part 1: Walls and BS EN 1364-2: 1999 Fire Resistance tests for non-loadbearing elements - Part 2: Ceilings. Our high quality 1-Hour Fire Rated Picture Frame Access Panels are perfect for Plasterboard Wall and Ceiling use. The 25mm picture frame sits flush to the plaster board surface. All our Fire Rated Access Panels have a very slim profile and are amongst the neatest on the market when fitted. Made from 1.2mm Zintec steel with a tough white powder coated finish (RAL9010 with 20% gloss). Draught sealing tape applied to surface joints to ensure maximum air seal. Plaster Board sheet fixed to inside of door to provide fire rating. Gas Flue Inspection Hatches in accordance with Part J of the Building Regulations / Gassafe recommended specification. Any other application where a robust panel is required to give access to building services, plumbing services or Electrical services while maintaining the integrity of the fire rating of the surrounding wall or ceiling. Fire Rated Access Panel lock options As standard Fire Rated Access Panels are supplied with a twist style lock, operated with a square ended black plastic key. Tamper Proof locks are also available as an option, please allow an extra day for delivery when using this choice. Every model in this range complies with B.S.476: Part 22:1987 and is tested to give a minimum fire rating of 60 minutes. 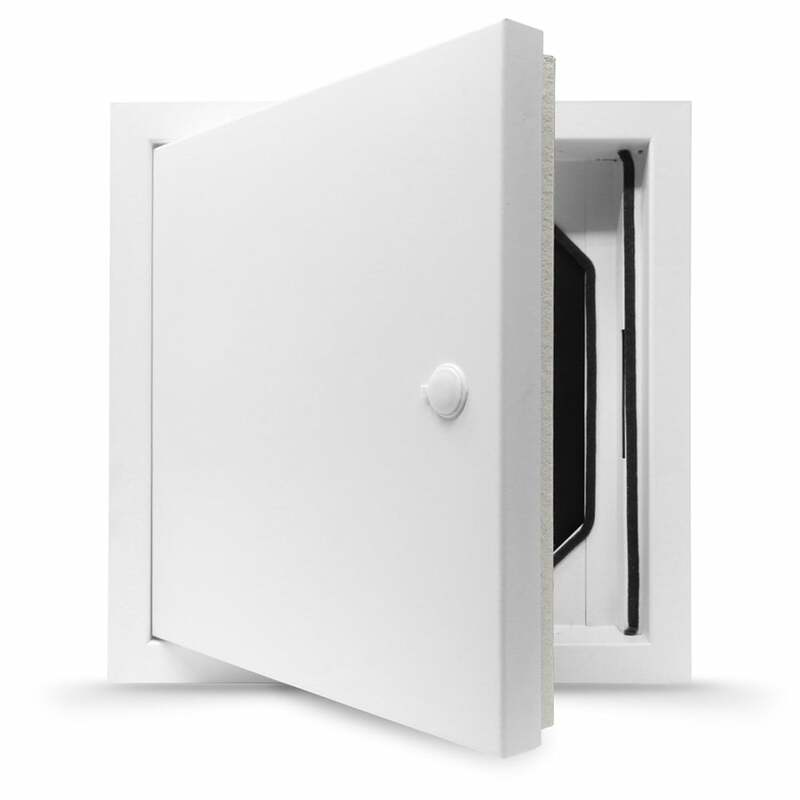 In addition to this our picture frame access panels meet Part J of the Building Regulations relating to inspection hatches for concealed flues in voids. Showing 2 of our total 3 reviews, with an average rating of 4 stars. Read all 3 reviews for Part J Gas Flue Inspection Hatches Tested to B.S.476: Part 22:1987 and Compliant. Good hatch, delivered quickly, easily fitted and looks very neat. Unlike the review above my hatch did not come with fitting instructions. Not a problem as it was pretty straightforward - just make sure the screws you use have a fairly small head as a poorly seated screw head would foul with the door edge. I also had the problem that the lock / latch mechanism was overpainted and jammed so this had to be cleared before fitting hatch. Otherwise good product , good delivery and good service.